Not really, I couldn’t get into the characters. It was high school drama (like I really want to revisit that stuff). Sadly this is where I call it quits. 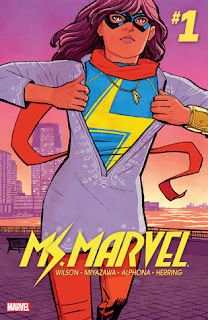 The art was good and don’t get me wrong I love Ms. Marvel. Growing up Carol Danvers was one of my all-time Marvel heroines. But this new Ms. Marvel girl just wasn’t for me.